← Are Traditional Handicrafts Good for Society? What is the place of handicrafts–especially traditional handicrafts like spoon carving, basket weaving, pottery, and blacksmithing–in today’s world? Before I answer the question, allow me to indulge in a little philosophy. Since at least the 13th century A. D., and probably since the 4th century B. C., philosophers have distinguished between the liberal arts and the servile arts. The liberal arts are ends in themselves; they may have practical applications, but they are essentially pursued for their own sakes. (In the Middle Ages, there were exactly seven of them: grammar, logic, rhetoric, arithmetic, geometry, music, and astronomy.) The servile arts, on the other hand, aim at some pragmatic good. They are pursued for ends beyond themselves. If it weren’t for their practical results, they probably wouldn’t be practiced at all. This is a very practical tool. It cuts wood. Why, then, does it have decorative elements on the handle? Do they serve any purpose? So, got that? Liberal arts are pursued for their own sake; servile arts are pursued for the sake of something else. So, for example, if I could still play the piano, I might sit down at a piano and play a Bach minuet for the sheer pleasure of it. Thus music is a liberal art. If, on the other hand, a button falls off my shirt, I might sew it back on. I don’t enjoy sewing buttons on–in fact, I find the whole operation tedious. I do it because I want my shirt to button properly. Thus, sewing is a servile art. But here’s the problem: in an age of mass-produced clothing, a lot of people now sew for fun. A friend of mine is getting married next year and has decided to make her own wedding dress. She could afford to buy a nice one if she wanted to, but she has chosen to sew the dress herself. At some level, she is undertaking the work for its own sake. On the other hand, many chain stores now play “mood music” continually. The music is deliberately chosen (and sometimes composed) to subtly influence customers to buy merchandise. The music is valuable only insofar as it increases sales. That brings me to the assertion in the title: the old servile arts are the new liberal arts. 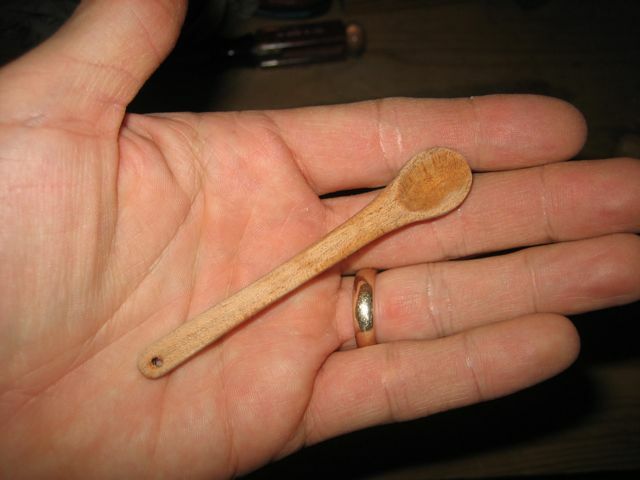 Spoon carving is supposed to be a servile art. But what purpose does a spoon like this serve? There was a time, I suppose, when manual labor (if you include agricultural work) was the norm for most people in the West, but the Industrial Revolution changed all that. There is still some meaningful manual labor available, such as electrical work, plumbing, and auto repair. But skilled, manual labor is no longer the norm for most Westerners. Individuals can go back to practicing pre-industrial crafts, but I’m afraid that societies can’t. And while a few skilled artisans may be able to make a living using traditional methods, most cannot. This leaves traditional handicrafts in the hands of amateurs–people who practice them but do not depend on them for their livelihood. 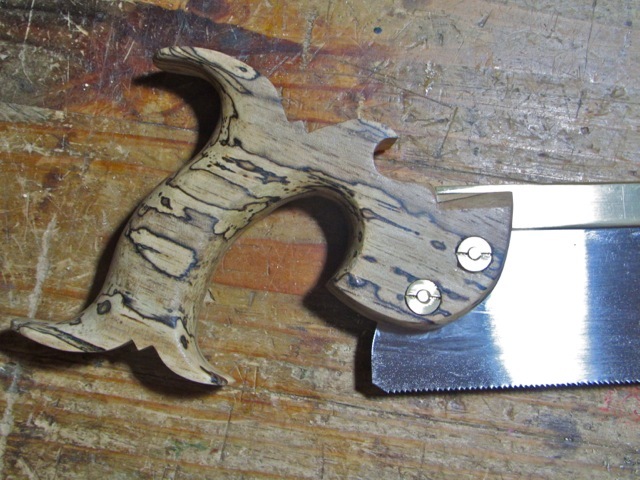 Often they begin to pursue a craft out of some pragmatic need, as I did when I started working wood. I needed bookshelves that could actually hold books. But then something happened. I began making things (including tools) not just because I needed them, but because I enjoyed the process of making them. At some point, I crossed the line from practicing woodwork as a servile art to practicing it as a liberal art. I find that many amateur craftspeople do the same. The disadvantage of leaving the older handicrafts to the amateurs is that these people often have little time to devote to learning the craft, and they can have trouble finding mentors locally. It can take them years to learn what the old professionals learned in only weeks. On the other hand, an amateur is free from the burden of the market. He or she can make something without worrying much about labor costs and overhead, and if an amateur furniture maker wants to try out some new style or design feature, he or she is free to do it. The professional furniture maker doesn’t always have that luxury. Paradoxically, many of the old liberal arts function a lot like servile arts. Professionally, I teach in the liberal arts–specifically literature. Because I do it for a living, I can’t always do it exactly the way I might like. If I want to explore a new avenue by, say, designing a new course, I have a long list of stakeholders to consider–administrators, accrediting agencies, colleagues, and students. It is very seldom that I can actually pursue literature solely for its own sake. If, however, I want to try veneering or French polishing, all I need to consider is my available toolkit. One or two specialized tools, and I’m free to go in a new direction. I don’t have to need to veneer a piece of furniture; in fact, I don’t need to build things myself at all. There are days I just want to make a box, a spoon, or a pipe. So I do. I may end up using it, selling it, or giving it away, but those outcomes are secondary. In itself, the work can be utterly gratuitous. In a very real sense, my woodworking is far more free or liberal (in the old sense) than is my teaching. This entry was posted in Musings and tagged liberal arts, servile arts. Bookmark the permalink. Really enjoyed this, thanks for sharing. I think it’s a common pattern that we often find something interesting, pursue it as a hobby, then it becomes our day job but that fundamentally changes are relationship with it. For me, programming started out as a hobby when I was a kid. Writing small BASIC programs that would make pixels dance across the screen was an end in itself. Now I write code that helps execute financial transactions and share medical data, a very pragmatic field that helps pay my rent. In the last few years, I’ve picked up hand tools woodworking as a hobby and it’s purely a liberal pursuit. Yet I would say that that things aren’t black & white. I still program for fun on some nights and weekends, and I think the ideal relationship (if it can be maintained) is to pursue some craft/profession both in a servile and liberal way. so sewing up people would be a servile art, right? I don’t know anybody who just does it for fun.